The response to “Self-Editing Tips: Part 1″ was gratifying, bringing us to More Self-Editing Tips: Part 2. Most readers agreed that professional editing is a necessity for self-published writers, and I want to emphasize that these tips are in no way meant to relieve you of your responsibility to hire a professional editor if you want to publish a high-quality book. Several readers suggested the strategy of reading aloud, which I will cover in a little more detail in this post. Another reader suggested adding tools for determining the reading level of your manuscript, something I had not given much thought to, so I will be adding it here. This list continues where I left off in the previous post. These self-editing tips relate to errors or problems you may not be aware of. Interesting phrase, isn’t it? This is where a character may have body parts acting independently of the character. Sometimes this construction creates an image that is hard tounsee once you’ve imagined it. I had a client once whose characters seemed to be victims of their own body parts acting without permission on nearly every page. (His arm wrapped around her shoulders. Her head leaned against his chest.) I sent the manuscript back to her with a request that she do some self-editing before I took up the manuscript. I could have gone ahead and charged her my hourly rate to do it myself, but I didn’t think that would have been fair. I gave her a quick tutorial on autonomous body parts and some online resources to use to learn more about it. She did fine and her revised manuscript was much better for her efforts. He reached out a sympathetic hand. Helen looked up with hopeful eyes, then swung an eager arm towards him and allowed her optimistic fingers to grasp his. “Yes,” she said, her voice strong enough to shock her own ears. He grinned, his confident mouth lighting up his forthright face. Her heart, delighted, seemed to laugh within her chest–the chest which was usually so reserved and timid. She looked into his eyes and saw them grinning at her. But was there something else there? A hint of trepidation, perhaps? Behind their apparent delight, what were his eyes really feeling? It was impossible to know what was going on in those eyes’ head. Was their heart truly in it? Background image, RAVEfinity via Flickr Commons; Text via Bullwer-Lytton Fiction Contest. Generally considered a pejorative term for writing that is flowery and ostentatious. If the writing draws attention to itself and distracts the reader the reader from the story, it should be rejected. Tracey Culleton, at Fiction Writers’ Mentor, says, “Every time you think proudly to yourself,That’s a lovely phrase, take that as a warning sign.” You should, in that case, ax that phrase or sentence. Culleton points out, though, how hard it is to start self-editing your beautiful writing, so she suggests keeping a special file in your computer where you can copy the text and keep it. You can take it out now and then and admire the beauty and then put it away. You may have heard the writer’s admonition regarding purple prose: “Kill your darlings.” It has been variously attributed to Chekov, William Faulkner, G.K. Chesterton, Eudora Welty, Oscar Wilde, and Allen Ginsberg. In his book, On Writing, Stephen King elaborated on the advice: “Kill your darlings, kill your darlings, even when it breaks your egocentric little scribbler’s heart, kill your darlings.” The earliest known use, however, came from Arthur Quiller-Couch, in 1914, when, in a lecture on the art of writing, declared, “If you here require a practical rule of me, I will present you with this: ‘Whenever you feel an impulse to perpetrate a piece of exceptionally fine writing, obey it—whole-heartedly—and delete it before sending your manuscript to press. Murder your darlings.” Very practical self-editing advice. 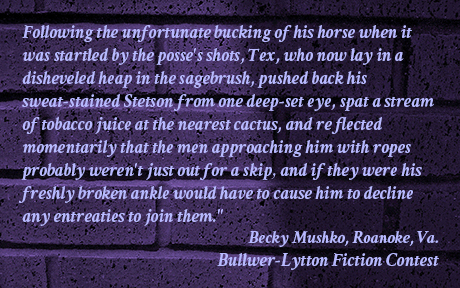 The Bulwer-Lytton Fiction Contest, invites writers to submit the best openingsentence (just one) for the worst novel, promoting purple prose for the fun of it. On the contest web page, the rules are clearly stated, concluding with, “in keeping with the gravitas, high seriousness, and general bignitude of the contest, the grand prize winner will receive … a pittance. You may inflict your entries either by electronic or surface mail.” It is here you can let your propensity to purple prose run wild and forget about self-editing it out of existence. “Nigel lifted his Mont Blanc pen and held it in brief repose as he gazed past the conflagrative crackling of the fire in the hearth, through the triple-plate bay window, watching the incandescence of the twinkling stars like the detonation of a million flashbulbs, and the preponderance of frothy snowflakes blanketing the earth as creamily as marshmallow fluff, then, refreshed and inspired, he began to compose his annual Christmas form letter.” From Linda Gauer, Norton, Ohio. I recently attended a writing workshop sponsored by Writer’s Digest. Each participant was asked to bring a copy of the first page of their novel for use in a session. The workshop leader, Chuck Sambochino, read our pages aloud while two professional, literary agents followed along. Chuck asked them to raise their hand at the point where they would stop reading if the manuscript had been submitted to them. I was astonished at how much purple prose was in evidence. There were only a few pages that were read all the way through and sometimes, when the prose was very purple, Chuck did not even finish the first line. This is what happens to the reader when the writer suddenly changes the viewpoint character (point of view) within a scene (or even within a sentence!) It pulls the reader from one orientation to another, which can be confusing. Decades ago, we would call this omniscient point of view, which requires very careful handling. In recent years, literary agents and publishing houses have discouraged its use. It’s OK to do it so long there is only one point of view per discernible section/scene; that is, so long as there’s something to represent to the reader that there has been some kind of jump. A chapter or a space break or something. But when it happens in the middle of continuous action, it’s a serious problem. It usually distances the reader from the close emotional connection with the central point-of-view character in the scene, it draws attention to the fact that writing is an artifice (destroying the “suspension of disbelief” that reading a novel usually though not always entails), and it generally just plain sounds awkward. Unless it’s masterfully pulled off, it usually signals a lack of control of authorial voice, to my mind. 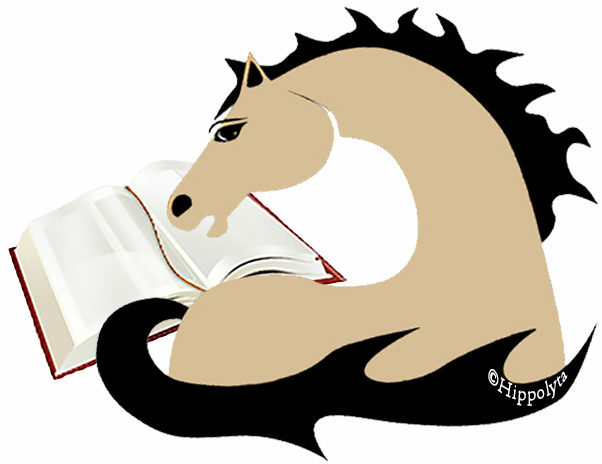 An agent teaching an online course I took not long ago, insisted on only ONE point of view in a scene–the scene break or extra space are important for keeping your reader aware of changes; no more than six points of view in an entire novel. Reading our writing aloud makes us slow down and listen as we read. It makes it easier to hear where we have omitted a word, or repeated a word, or where we have written a clumsy sentence. However, it’s not foolproof. Our brains will still attempt to fill in the blanks or interpret the text according to our intentions. This is especially true when we’ve worked on the manuscript for a very long time. Read-aloud programs/apps are much more helpful because we hear another voice and our brain isn’t trying to manipulate that disembodied, somewhat mechanical voice. Word has a text to speech feature, although I’ve never used it so I can’t speak to how effective it is. Adobe Acrobat Reader has a good read aloud feature, but one caution: don’t convert a fully formatted manuscript (page headings and page numbers) to a pdf and try to use the reading feature. The reader will read each page number when it reaches the bottom of the page and then read the heading when it moves on to the next. It’s annoying and it defeats your purpose. I use an app on my tablet called Voice-Aloud which I really like. You can select the reading speed along with some other features and it’s easy to mark places where you need to come back and fix things. I usually use the app to read the whole manuscript over several days, taking notes and marking places in the text that need to be fixed. I don’t stop the reading to fix things as it goes along, although you may find that is a strategy you can use effectively. Walk away from your manuscript for a few days and come back to it so you can begin self-editing with fresh eyes and a clear brain. You’d be surprised what you can find after a few days of ignoring your darlings. Changethe appearance of the manuscript. It fools your brain into thinking you are reading something new. Read paragraph by paragraph from the end of the chapter to the beginning. This forces you to see the paragraph as an entity of itself, not something within the flow of the story. Too often, when we are proofreading, reading to revise, or self-editing we get caught up in the story. That’s one reason why the first page or first chapter of a book might be better than the rest. We spend a lot of time on those beginnings and then our self-discipline fades and we just start enjoying our story. You need to know who your target audience is for any text you write. If you are writing children’s books or young adult novels, you must make certain that your audience can read, understand, and enjoy your story. It’s even true if you are writing for an adult audience. The Fleisch-Kincaid Reading Ease Continuum is a scale from 0-100, where the lower the score, the higher the reading level of the text. It’s a generalized continuum, with the scores corresponding to the grade levels of the readers; that is, zero is the reading level of most kindergarten children, twelve, the reading level of most high school seniors, and so on. You can use this online readability-index calculator, to determine the readability of your manuscript. Readers who have additional self-editing tips should feel free to add them here by way of comments. The more we have in our repertoire, the more effective we will be when it comes to self-editing our work. Remember, though, these tips are not the be-all and end-all of editing. Your professional editor will fill that role.